Khalil Mack was in Chicago on Sunday morning to sign the richest contract for a defensive player in NFL history. He posed for pictures dressed in Bears colors and held a press conference introducing himself to a new team, new town. It was a strange moment to be sure, the first time as a professional he wasn’t representing Oakland and the Silver and Black. It was something Mack didn’t see coming. He was focused on staying ready for a return to football. He let agent Joel Segal handle work getting a new contract. 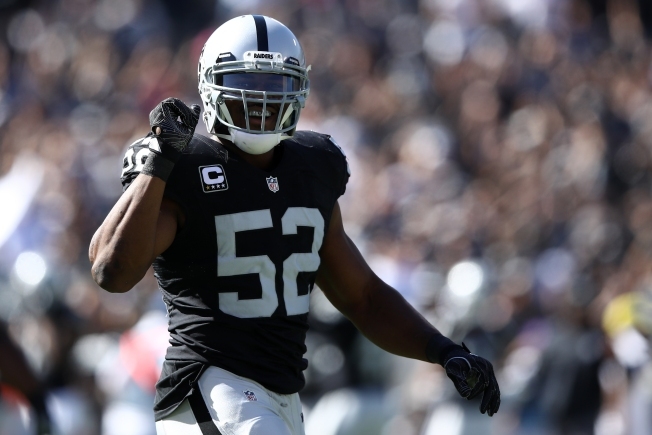 He was a Raider and expected to be one, and admitted surprise when he was traded to Chicago for a package that included two first-round draft picks. "I was definitely shocked, but you can’t really…you don’t have time to be shocked for long," Mack said in his press conference. "It’s like, '(I’ve been traded)? Oh, word. What time’s the flight? Tonight?' You don’t have time to think about it. I’m just looking forward to playing this game I love." He’ll now play in Chicago. Leaving old friends back in the East Bay, including quarterback Derek Carr and fellow edge rusher Bruce Irvin. "You get texts from your teammates, well, your old teammates, and you could say goodbye that way," Mack said. "You really don’t have that chance. It’s a whirlwind. I have to get in here, learn the playbook, figure out my new teammates, figure out where they’re heads are at and come here and try to contribute to win." He called the Raiders "a great, great organization," but was predictably forward thinking when speaking with Chicago press. He said the trade became reality on Saturday, not before. "There was a real sense then," Mack said. "It has been a whirlwind. It’s new, but it’s exciting. I’m looking forward to it. I’m itching. It has been a long time since I have played football." Mack could play as soon as Sunday for his new team, as the Bears give him a crash course in Vic Fangio’s system. He’ll be paid handsomely to do so after formally signing a six-year, $141 million contract that includes $90 million in guarantees. The deal eclipses one signed by Aaron Donald on Friday. Mack said he was shocked when the Rams defensive tackle signed a six-year, $135 million deal. "I can’t say it around my parents," Mack said. "I would say it if my parents weren’t here … I’ll just say, 'Dog!'" Mack admits great expectation comes with such a massive contract. "Absolutely. I’d be lying if I told you (there wasn’t pressure)," he said. "Based on how hard I work and how hard I play, I want to be able to show why (I’m the highest paid). I’ve always believed that I’m the best defensive player in the league. I want to be the best at what I do. That’s what comes with Mack."